Glenbower gets it’s name of “gleann-bodhar” or “Deafening Glen” from the noise the Dissour makes when rushing headlong in winter through the valley. of Sir Arthur de Cappell Brooke, who in the 1830’s built the present road and bridges through the wood. It’s worth noting that the de Cappell family retained ownership of the wood from 1182 to 1933. 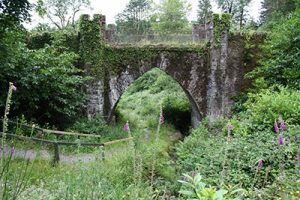 In the early 1800’s a contemporary writer stated that the sides of Glenbower were richly wooded, and that it was one of the few remnants of the ancient forest which once covered the country. It’s steep slopes being inaccessible and useless for agriculture, it escaped both the axeman and intensive grazing over the centuries when the Irish countryside was generally denuded of it’s timber. The wood was acquired by the then Forest and Wildlife Service (now Coillte) in 1933 and many stands of coniferous trees were planted in the following decades. In recent years much of this timber has been felled and a replanting programme is ongoing. Flowing through Glenbower is the Dissour River which gets it’s name from the Gaelic “Dis” and “Ur” or “Twice Wetted”, from the belief that in producing linen long ago, one wetting of the flax in the waters of the stream was as good as two wettings in other water. 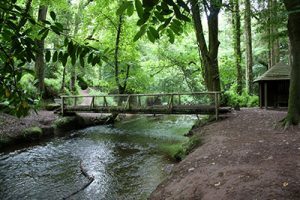 Over the years most people look back at the pleasure had in Glenbower Wood, whether it would be a leisurely stroll around the lake on a gentle summers evening with a loved one or an energetic calorie burning march to undo the excess of the Sunday Dinner. Some people used to sit and pass time by the lake watching the squirrels the bird life or the fish rising to a fly, or to watch the Salmon or Sea Trout leaping up the fish pass. Anyone who ever spent time in the wood became enchanted by its beauty and serenity, and everyone who had visited, had his or her own story to tell. If the truth were known many marriages were created by the wood as it was a favourite place for many a courting couple to stroll. Unfortunately this beautiful parkland was devastated in 1989 when the dam was breached and the lake was drained on the grounds of public safety, leaving an unsightly bed of mud which has now become an unsightly wilderness with treacherous mud banks. The Management Committee have been working hard for many years to keep this woodland park available to the general public, and all this has been financed by various local fund raising efforts. entering the Sea at the noted angling beach at Pilmore Strand. The river prior to the destruction of the dam was noted for its Sea Trout runs together with its share of Salmon. The existing fish pass ( built by the inland fisheries trust in 1958 ) of the dam appears to be quite functional and would require little to restore it to full working capacity.